Not long ago, we had a customer trade in a Nautique GS22 for a new Centurion. Pricewise, the Nautique GS22 is in a similar class as the Centurion Fi23, so we took both to the lake to see how they compared. The Nautique GS22 is known to be one of the best crossover boats on the market and the Fi23 is known to be the best wakesurf boat in its class – by a longshot. 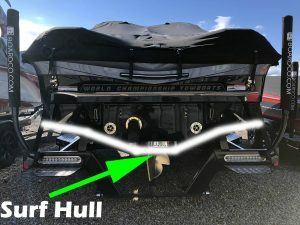 We had never been on a Nautique GS22 and were eager to check it out because Nautique uses a flat hull with a surf system and ballast (1) whereas Centurion uses a V hull with a surf system, ballast, and XL trim plate (2). We wanted to know how they compare. Both boats were tested with stock settings and three people – two in the boat while towing one behind. After running the boats back to back, the differences were clear. Not only was the Centurion surf wave noticeably longer and more massive, but it was also infinitely more adjustable. The Nautique dishes out a surfable wave, but it was a bit underwhelming. As for skiing, the Nautique wake was superior to the Centurion, though not as much as we expected. 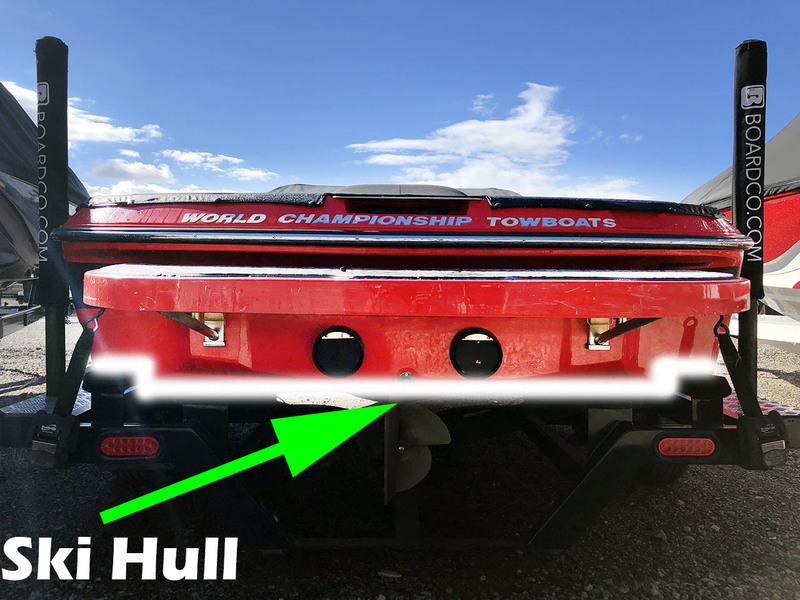 The combination of the hull and drive system improved the ski wake on the GS22, but caused it to easily slide from side to side when a skier pulled on the boat. 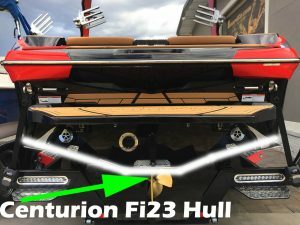 The Centurion Fi23 on the other hand, was unaffected by the skiers pull and the only difference in the wake was a slightly deeper trough on the sides of the wake. Once the center Stinger Plate was positioned properly, the deeper part of the Centurion hull was lifted out of the water and created a very flat ski wake. The wakeboard wake was as drastically different between the two boats as the surf wave. The Centurion Fi23 does pack twice as much ballast and produced a wakeboard wake that was not only more adjustable and poppy, but it was on par with the highest end wakeboard boats on the market. The Centurion Fi23 clearly had a better wakeboard wake because it comes stock with the ability to make a pro level rider happy, and the ability to adjust the wake to give a beginner an easy time learning. 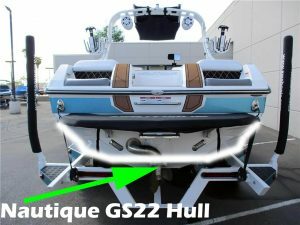 The Nautique GS22 wake was small, soft and only adequate for a beginner to intermediate rider even when fully ballasted.